In my first post in this series we looked at scaffolding a new commandlet project. In this part we're taking a deep dive into how to do OAuth authentication against the new admin API. I'm going to document the process like I did it (without all the mistakes) to explain how I work when I try to figure things out. If you're just interested in the code then feel free to scroll down to the bottom or check out the last post in this series. Also, check out part3 here. The tools I've used for this module is Visual Studio (I'm using enterprise edition, community should suffice), PowerShell and Fiddler. We're going to start where we left yesterday with fleshing out our AuthenticationHelper class with some more content. We are not going to play hackers from the 90's, so we're starting out with the documentation from Microsoft on how to authenticate against the new admin API. This sample is pretty good, it works excellent for the admin services, especially in a web project or native app with background processing. We, on the other hand, are making a commandlet, so we are going to do things synchronously. The first thing to do is to specify some connection details first. 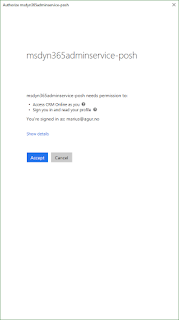 To be able to authenticate using OAuth we need to register an application in Azure AD first, and then we need the Application Id and a reply url in our application. You don't need Azure AD premium for this, so feel free to create a free subscription to do this. 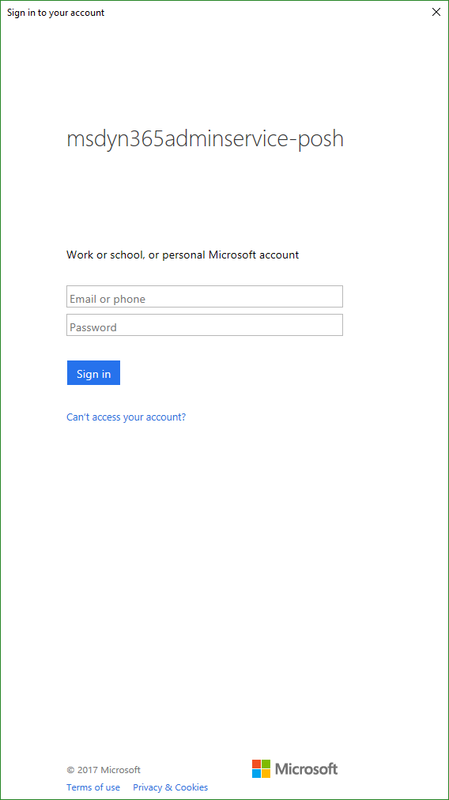 Navigate to the azure portal, and then go to Azure Active Directory, and the App Registrations blade. Click the + New application registration button to register a new app. Enter a descriptive name for your app, and then select Native as the application type. Next we go into the app settings, choose Required permissions, and then click the + Add button to add a new permission to the application. From the Application Permissions choose Dynamics CRM Online (yes, they should update this name), and for permissions select Access CRM Online as organization users. 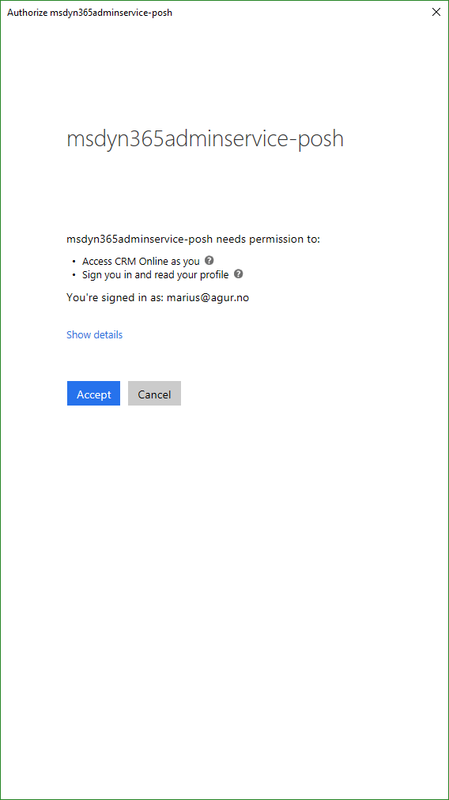 As you can see, this permission does not require admin approval, which means that for multi-tenant apps, a user can choose to use this app without requiring the approval of an AAD admin. Finally, click the Grant Permission button to actually grant the permissions specified. If you don't do this then the permissions will not go into effect. Next up we are going to create a method to identify the authentication Authority and the resource address. We could add these statically since we know which addresses we are going to use, but in part3 we will look at how to reuse this helper for the MSDYN365 Customer Engagement data api. Most of the method is a copy of the sample provided by Microsoft, but I've done a couple of tweaks to it to make it work better with our commandlet. 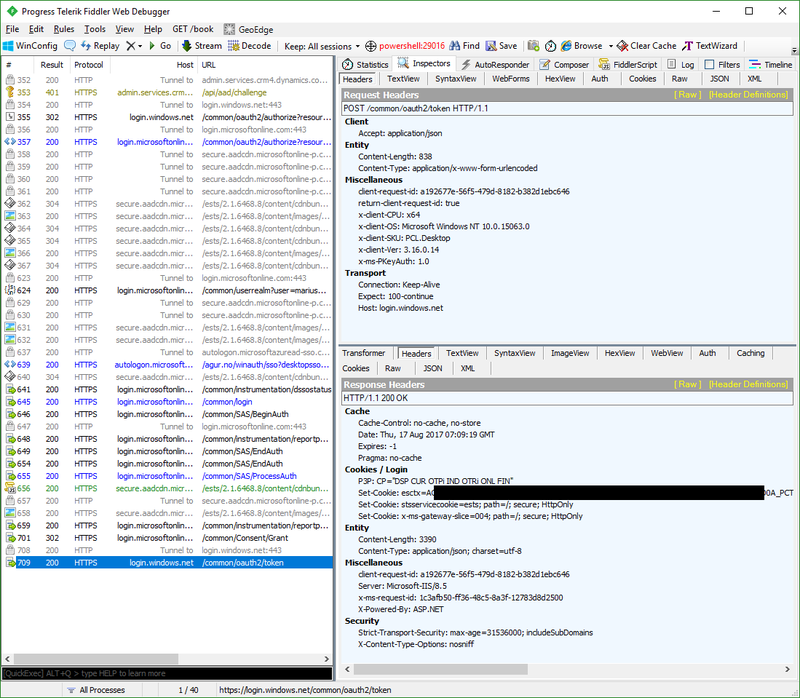 What we're doing here is sending a web request to a discovery URL, which will return a 401 challenge which includes WWW-Authenticate headers (more information on Microsoft docs). These headers include the resource URL as well as the authority URL. The authority URL tells us which service URL we have to query to authenticate, and the resource is simply which resource we're requesting a valid token for. Add the following line to the end of the ProcessRecord method in your cmdlet class to instantiate a new AuthenticationHelper object, which we're going to use for debugging. If you're like me then you might wonder why we can't use the same URL as we're using to query the admin API, so I did a little debugging to figure it out. If you're not interesting skip right to the next part which will continue on our quest to authenticate. First of all, if you want to replicate what I'm doing then make sure you've installed Fiddler, and enable HTTPS decryption. To debug what's happening when I query the discovery URL I've added the following line to the public constructor, just beneath setting the endpoint (duh). The appended path to the URL is specified in the Microsoft docs on authenticating against the admin services API, I'm going to elaborate on why I think this was a bad choice in the next part (please don't punish me). Now add a breakpoint to the line added so we will get the chance to actually get some data. Now, to debug a cmdlet we have to add some parameters to the project. Right click the project in the right hand navigation, and select properties. 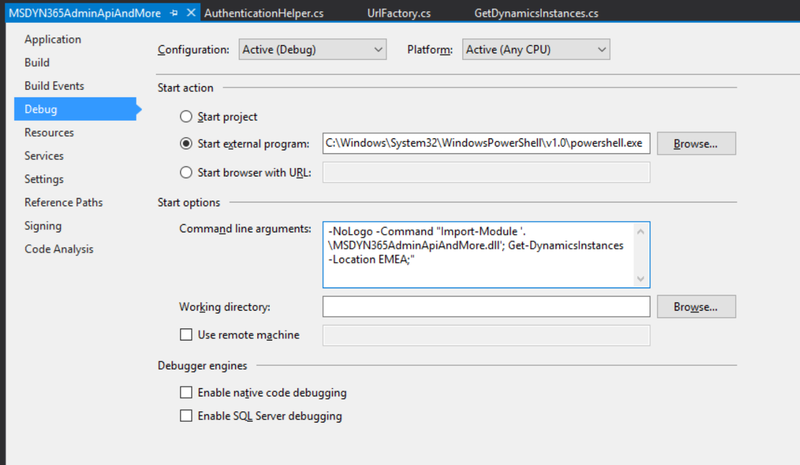 -NoLogo -Command "Import-Module '.\MSDYN365AdminApiAndMore.dll'; Get-DynamicsInstances -Location EMEA;"
This will launch a PowerShell window which runs our commandlet when we start debugging it, and we will be able to step through it as the code executes. Now start up fiddler (you've remembered to enable HTTPS decryption I hope), and hit [F12] to stop capturing. Delete the requests that might have popped up already by marking them and hitting [Delete]. Resize the fiddler window so you can see additional windows at the same time. Now start debugging your code in Visual Studio, and wait for it to hit the break point. 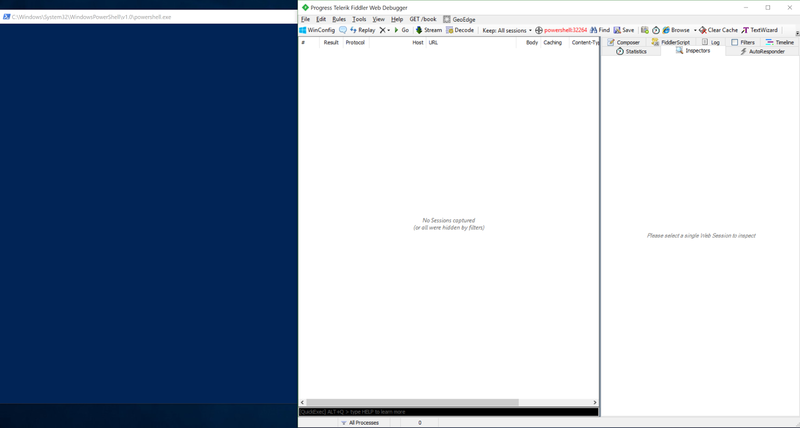 When the breakpoint hits and the execution pauses, find the PowerShell window that was started and bring it into the foreground. Then find the fiddler window and bring that to the front. 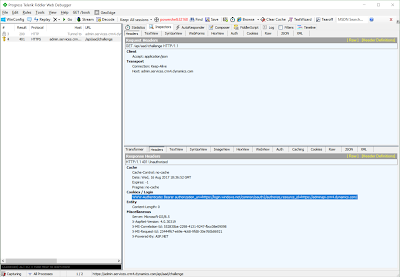 Press [F12] in your Fiddler window to resume capturing, and then go into Visual Studio and press [F5] to resume execution. If you've done everything correctly it should look like this in your fiddler window once the execution is finished. This one tells us what the resoure id is. What we can see here is that the resource ID is different from the admin service URL specified in the Microsoft docs. A: The resource id needs to be specified when you're requesting an OAuth token because it will issue a token which is valid for a service with the given resource id. If you're using the service URL then you will still get a token when you authenticate, but if you try to call the admin service API you will get a 401 unauthenticated error because the bearer token has a resource id which doesn't match the resource id of the API. 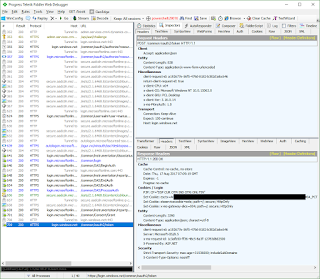 Now that we're done debugging, remove the DiscoveryAuthentication-line we added in the constructor so it doesn't interfere with what we're doing next. Again, we're utilizing the idea Microsoft had for the sample code. It's a good piece of code so there's no reason to reinvent it. I've simply made a few, small changes in the process of understanding how it works. First of all we're going to add an authentication context. 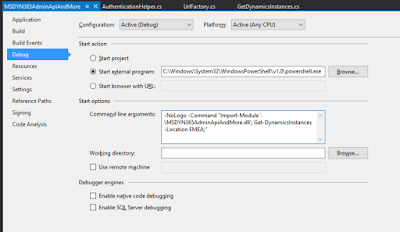 The constructor for AuthenticationContext takes an authority URL as a string input, which means that we have to run the DiscoverAuthority method before we can add a context. To do this we're adding a public property which will return the authority URL or run the DiscoverAuthority method and return the result. Then add a public property to retrieve it. Notice that if we now try to get the authentication context, and the context is null, then it will instantiate a new authentication context and return that. Upon instantiation, if the Authority is null, it will also run the DiscoveryAuthority method which will propagate the private string values for resource and authority. Now that that is out of the way, it's time for the actual authentication. As earlier, we first create a private AuthenticationResult set to null. Then we create a method used to authenticate against the API. As we can see from this code we first check whether _authResult has a value, and then we see if the expiration date is less than thirty minutes. If either of those conditions are true we perform a new authentication against the resource we got earlier and assign it to _authresult. To acquire the token we also have to submit the clientId (application id) and redirecturl (reply URL) we got from registering the app in Azure AD in the previous post. If we don't specify these, or use invalid values, we will get a response with a very good description of what went wrong. 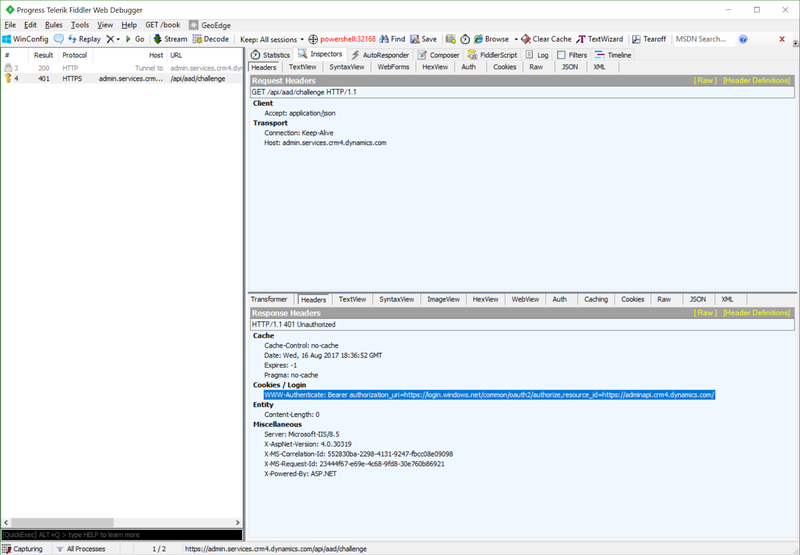 Finally we add a public property which calls the Authorize() method before returning _authresult. We don't need an if-clause in this because we're already checking inside the Authorize() method. Because we're using the public property of AuthContext here we can actually call retrieve the public AuthResult object without instantiating anything first, as all the objects used are propagated through their public properties. We'll now hook up fiddler and look at the authorization results. If you're not interested in this part you can jump straight into the next blog post to see how we can create our own custom HTTP message handler and send requests to the adminapi. To test this part we'll add the following line to the end of the ProcessRecord() method in our commandlet class to trigger all the methods we've added. Now just add a break point to the new line, make sure you have fiddler started and ready, and then start debugging your code. 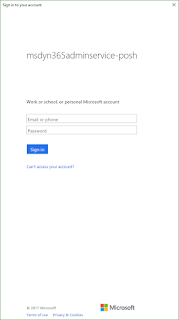 Just fill out your credentials, and approve sign-in with Azure MFA (if applicable). Next you will be presented with a window which says that the Azure App you registered earlier needs permission to access CRM Online as you, as well as sign you in and read your profile. There is nothing scary about these permissions, as they don't get access to any of your data. If you already trust the application enough to log in with it you're using then these permissions only says that it will use your authenticated credentials to perform actions. Basically, it looks worse than it is. Accept these terms, and wait for the execution to stop. Then, head back to fiddler and stop capturing traffic (hit [F12]). Look for one of the latest request (might be the latest, depending on how much you're capturing), host should be "login.windows.net" and the URL should be "/common/oauth2/token". The response here should be 200 OK, and if you check the headers it will look like this. This response is then transformed into an AuthenticationResult object in our code, and we can use that to set a bearer token in our actual API request. Finally, go back into the cmdlet class and remove the line which assigned AuthResult to clean up after debugging. In this post we've seen how we can build an authentication helper which queries a service for the correct resources, and finally authenticates against the authority to get a valid OAuth2 token. In the next part we'll finally perform the request against the MSDYN365 Customer Engagement admin API, and take a look at the response. Finally, we'll look at how we can extend this code to also work with the normal MSDYN365 data api.